1 of 5 Inside the Skwachàys Lodge with Chief Ian Campbell and Amanda Nahanee. 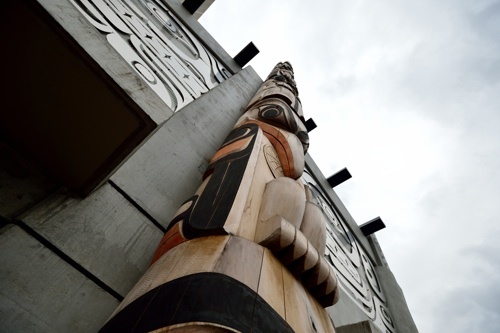 2 of 5 Amazing view of the Totem Pole outside Skwachàys Lodge in Vancouver, BC. 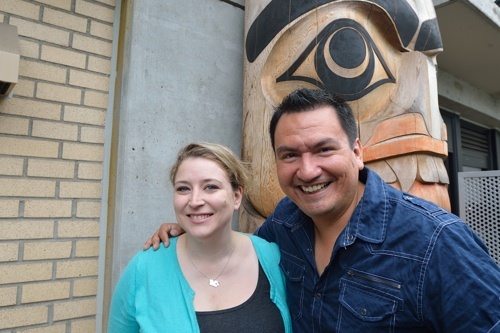 3 of 5 Rebecca Bollwitt (Miss604) and Chief Ian Campbell at the Skwachàys Lodge in Vancouver, BC. 4 of 5 One of the many gorgeous rooms in the Skwachàys Lodge in Vancouver, BC. 5 of 5 View of the Totem Pole outside Skwachàys Lodge in Vancouver, BC. 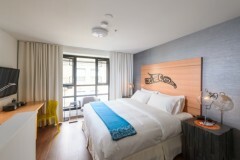 Visitors to British Columbia who are interested in learning more about Canada’s First Nations now have the enticing option of staying in an authentic and entirely Aboriginal-themed hotel. 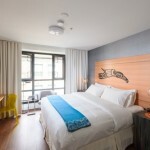 Recently, popular Vancouver blogger Miss604 went on a special tour of the new Skwachàys Lodge along with Squamish Nation’s Chief Ian Campbell and Amanda Nahanee. 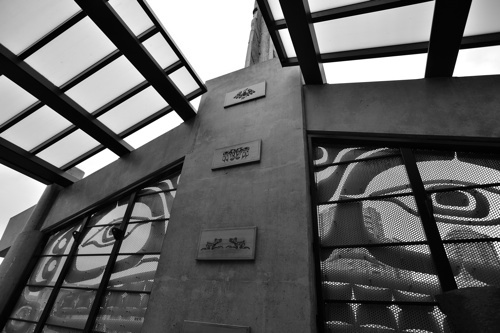 “Skwachàys is a traditional Coast Salish name that references the place name around the end of False Creek, with a number of sloughs and marshes that represented a portal into the spirit realm,” Campbell said while at the lodge, located just at the historic gateway to Vancouver’s Chinatown. The stately 18-room facility is billed as an Aboriginal boutique arts hotel, and is the first of its kind in Canada. More than just a hotel, the lodge features an artist’s studio where a number of talented First Nation artists hone their crafts and create works. An art gallery and gift shop allows visitors to purchase those and other beautiful works by Aboriginal artists. There is also the opportunity to be part of a sacred healing experience at a traditional sweat lodge, led by a First Nations Elder. 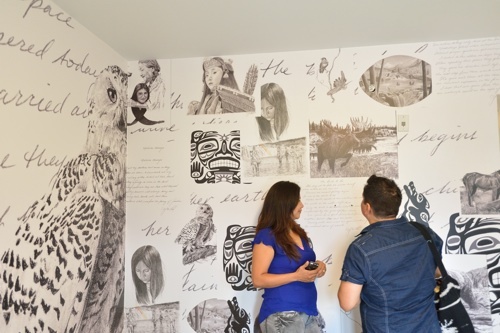 Originally opened in 2012 as an Aboriginal healing lodge for visiting First Nation members, as well as an artist space, the gallery facility has been redeveloped to include new boutique hotel rooms. Each of the 18 rooms has entirely different themes, complemented by original pieces of Aboriginal art and completely redesigned by a talented First Nations designer. Each of the hotel’s floors even has its own sacred animal. And much of the rich wood, materials and items in the hotel have either been reclaimed or donated. 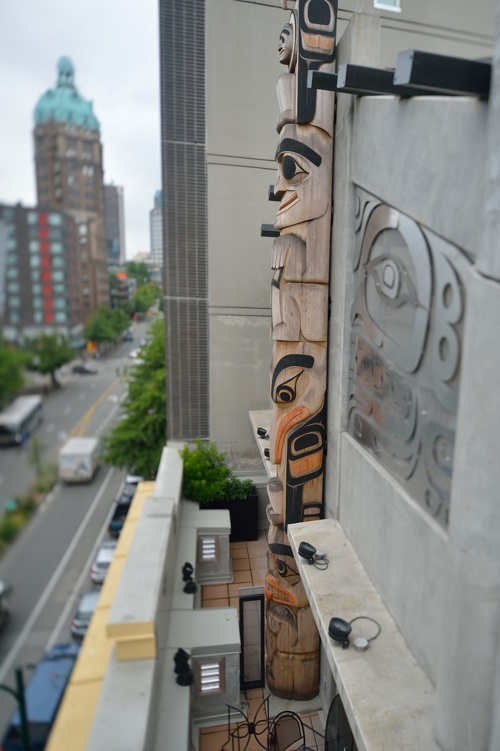 On the outside, the building’s Victorian-era brick façade has been meticulously preserved, but you will also spy a traditional northern longhouse – with 40.5-foot totem pole – sitting atop the heritage building’s urban setting. The Skwachàys Lodge officially opened on Aug. 1. Click here for more information on the Skwachàys Lodge in Vancouver. First Nations culture in the heart of the city. 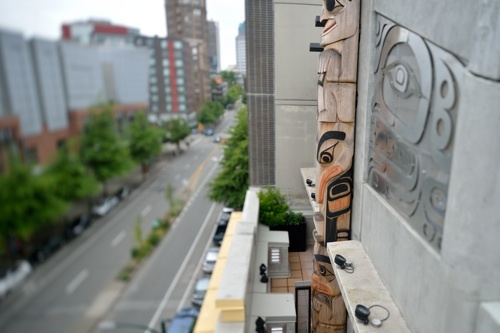 A totam pole overlooks the street in front of Skwachays Lodge in Vancouver, British Columbia.